Tour Argentina´s glaciers, hike Patagonia´s epic trails & kayak Tierra del Fuego National Park. Tour Argentina´s glaciers, hike Chalten, Patagonia´s mountain trails and kayak Tierra del Fuego National Park. From Buenos Aires´ tango shows and eclectic neighborhoods to the surreal, southern city of Ushuaia, heed the call of the wild and visit Argentina for a taste of adventure! Let us guide you through some of the most interesting and dynamic cities, and pristine, captivating landscapes of the world. Upon arrival, you’ll be transferred to your hotel, and you’ll have the rest of the day to enjoy the city at your own pace. Buenos Aires is a marvelous, cosmopolitan city, full of color and different types of architecture. Capital of Argentina and described as the Paris of South America, Buenos Aires proudly embraces this title, as well as showing off plenty of its own culture! So, today you are free to wander the cobblestone streets lined with outdoor cafes, enjoy the mouthwatering aroma of prized Argentine beef sizzling on an open “parrilla” (barbeque), and browse the local antique and artisan markets that offer plenty of bargain shopping. And to travel deeper and have a firm grip of the Argentine spirit, (Buenos Aires is home to some excellent local designers) and explore the colorful Palermo Soho neighborhoods. In the morning you will be picked up from your hotel, to begin our traditional Buenos Aires city tour. You will be swept away by the highlights of our beloved Buenos Aires. Over the course of a half day you will have the chance to visit the historical and political center of the city around May Square (Plaza de Mayo) and the Pink House (the presidential house). San Telmo with its cobblestone streets and the oldest residential neighborhood, and La Boca where Buenos Aires turns colorful and tango is ever present. The next stop is the chic and aristocratic Recoleta, where the big palaces remind us that Buenos Aires was once the “Paris of the South”. At the end of the tour you will be driven back to your hotel. In the evening you will be picked up from your hotel, and driven to a mystical place where you’ll discover one of our most ancient traditions. Tango is more than our national dance. Tango is our immigrant origins, the talent of our local artists, the sensuality of the Argentine woman, and our way to deal with a broken heart. Tonight you will enjoy a professional display of tango and music with a group of local artists onstage, immersed in an elegant and alluring place. The ambience, clothing and dance steps which tango lovers used to practice 100 years ago, will come to life again and you will travel in time for a night. This spectacular 3-4 hour long demonstration of the finest local dancing will be accompanied by delicious Argentine and international cuisine. Dinner is à la carte, and beverages are included so you can lose yourself in the ethereal taste of Malbec wine. At the end of the evening, around midnight, you will be driven back to your hotel , fully in love with the bohemian spirit of our beloved Buenos Aires. Included: transportation mentioned above, no guide. This morning you will be transferred to the domestic airport for your flight to El Calafate. Upon arrival in El Calafate, you will meet your transfer to start your 3 hour long trip to El Chaltén. 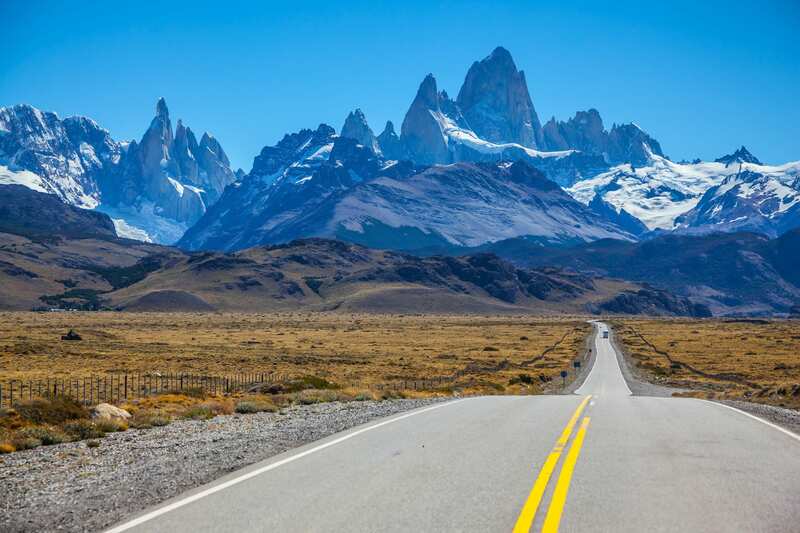 You will travel along the famous Route 40, surrounded by the Patagonian steppe. On the road you will have views of Lake Argentino, the biggest southernmost lake in Patagonia, and Lake Viedma, the largest Argentine lake formed by the melting of glaciers, in this case, Viedma Glacier. This lake leads to La Leona River, which connects both lakes, and where we find La Leona Road house, the place where the famous thieves, Butch Cassidy and Sundance Kid hid out for at least one month! After discovering other rough gems of this particular landscape, you’ll reach El Chaltén, and your transportation will drop you at your hotel. 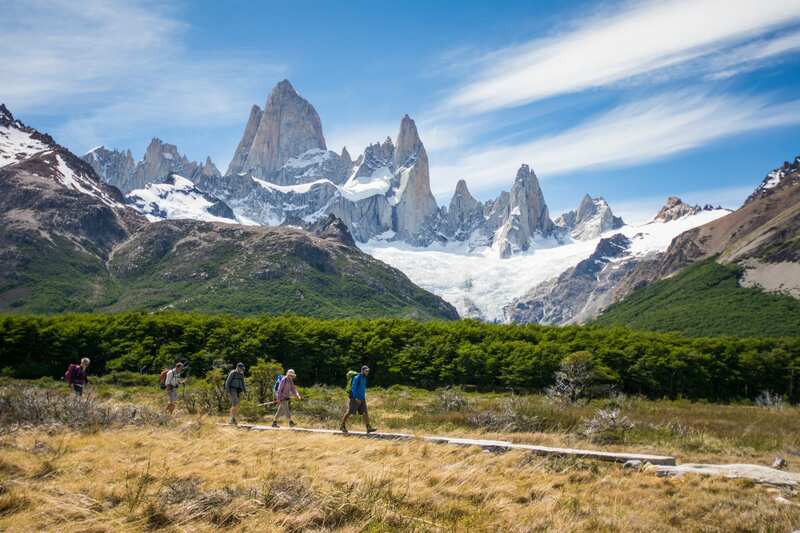 El Chaltén is the top rated hiking destination in Argentina. 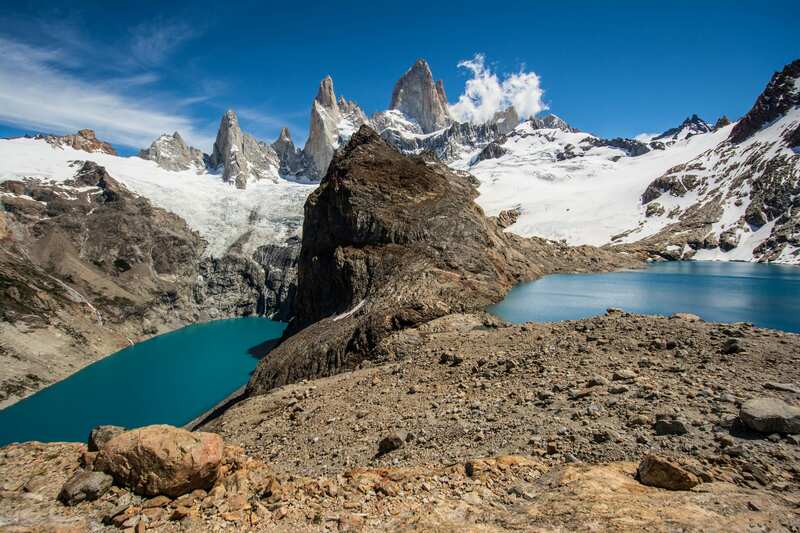 This charming little village, located at the foot of Fitz Roy Mountain, surrounded by glaciers, lakes, rivers and forest, is the start point for most hiking trails. A paradise for climbers and hikers alike. Note: keep in mind that the luggage should be equivalent to a bag up to 18k. Excess baggage will be an extra charge. Today you can take one of the self-guided (guided hikes can be arranged on request. Note: trails are very easy to follow) hiking trails around town and discover El Chaltén on your own, which is always an excellent idea. But, if you want to do something different, you can take a full day trip to Lago del Desierto (not included). We’ll take you in a bus through the valley and along the Las Vueltas River eventually reaching the Natural Reserve Lago del Desierto, and then we’ll sail for 50 minutes in a comfortable catamaran crossing the lake from south to north. After a short 15-minute stop, we’ll continue sailing to Vespignani Glacier where we’ll go ashore to take one of the hiking trails nearby. 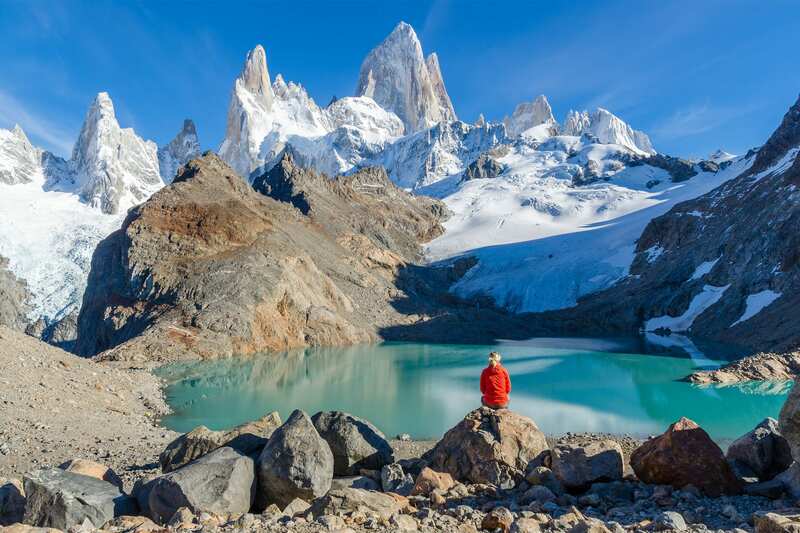 You can choose between an easy, interpretative trail through the forest, or a 45 minutes hike to get to the Vespignani Glacier’s base, and jaw-dropping views of Mount Fitz Roy. It’s up to you, and you can count on the assistance of the tour coordinator at any time. After the hike, we’ll enjoy a snack in our geodesic tent, just before sailing back to Punta Sur to take our bus back to El Chaltén. If you would like to add this tour for your free day, just let us know! It starts at that gorgeous wooden sign with the Laguna Torre and the woodpecker at his side, that you probably have already seen if you visited the Cerro Torre Viewpoint the previous day. From there, you will continue through a multi-colored landscape with glimpses of snow capped mountains through the native forest of lengas and ñires. You’ll pass by the De Agostini campsite and continue to the front moraine, where you will be about 15 minutes from the summit. From here, you can descend to the lagoon and see a floating iceberg passing by, or continue to the Mascardi viewpoint, 2 kilometres (1.2 miles) up the trail! Enjoy this hiking Mecca! Enjoy an early walk around town or a short easy hike during the morning. In the afternoon, you will board your bus back to El Calafate, so please be aware of timing with regards to your morning activities. The 3 hour long driving back will be a good opportunity to rest or just relax, enjoying the passing landscape at your window. Once you arrive at El Calafate, the bus will take you to your hotel. It’s your chance to try the tender and exquisite Patagonian Lamb or a heavenly tasting Calafate ice-cream. At Calafate, food options are varied: from veggie delicacies to the best demonstration of international cuisine. You can choose an upscale restaurant or a traditional local tavern to spend an unforgettable time. 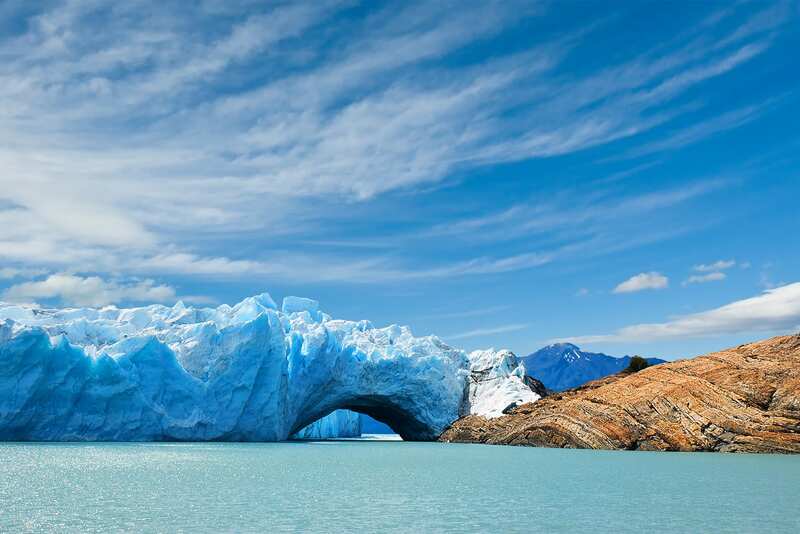 In the morning, we’ll drive you to Los Glaciares National Park to take the 6 hour long Perito Moreno Glacier tour. Los Glaciares National Park has been a UNESCO World Heritage site since 1981, and is home to approximately 200 glaciers. Half of this park is occupied by the campo de hielo patagónico (Patagonian ice field), the largest ice field behind Antarctica. You will travel 40 km (about 25 miles) from El Calafate to the park, enjoying the views of the Patagonian steppe. 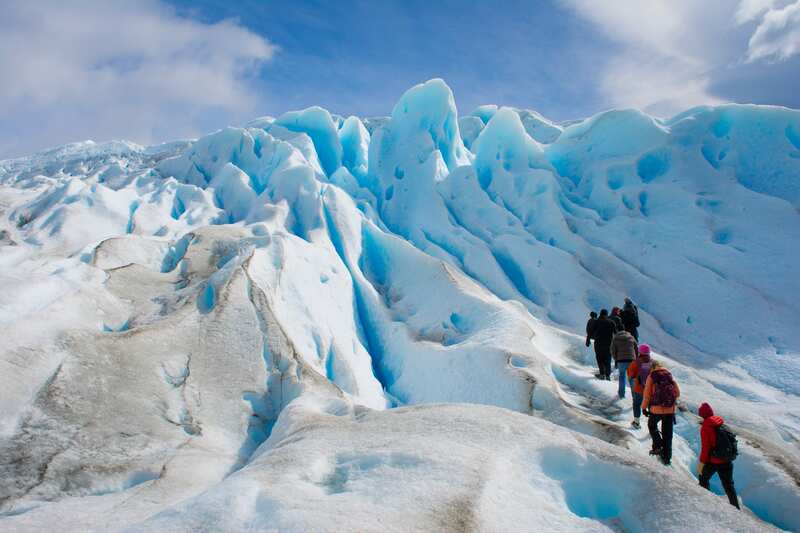 Once inside the park you will take the walkways to explore the different viewpoints, getting you up close to the magnificent Perito Moreno Glacier. If you’re lucky, you may get to see a piece of ice break off and fall from the glacier wall, sinking forever in the lake. For about one hour, a bilingual guide will provide you with a plethora of interesting information along the way. Note: For even more adventure, you may want to consider either taking the Big Ice or Mini-Trekking excursion (at an extra cost). Both allow you to hike on the glacier! 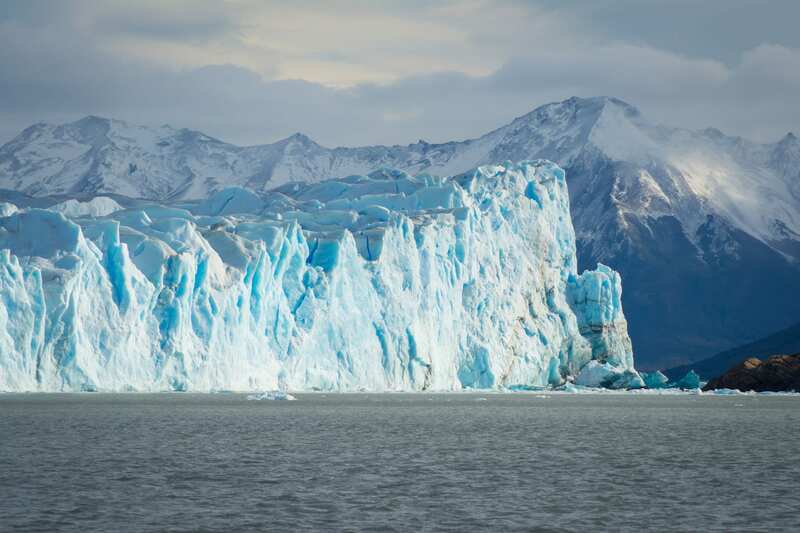 After our visit to the viewing deck, you will take a boat ride that will take you close enough to fully appreciate the 80 meter (262 feet) high ice walls of Perito Moreno! You’ll never feel closer to this gigantic and impressive natural masterpiece. At the end of this exciting day, we’ll take you back to your hotel in El Calafate. 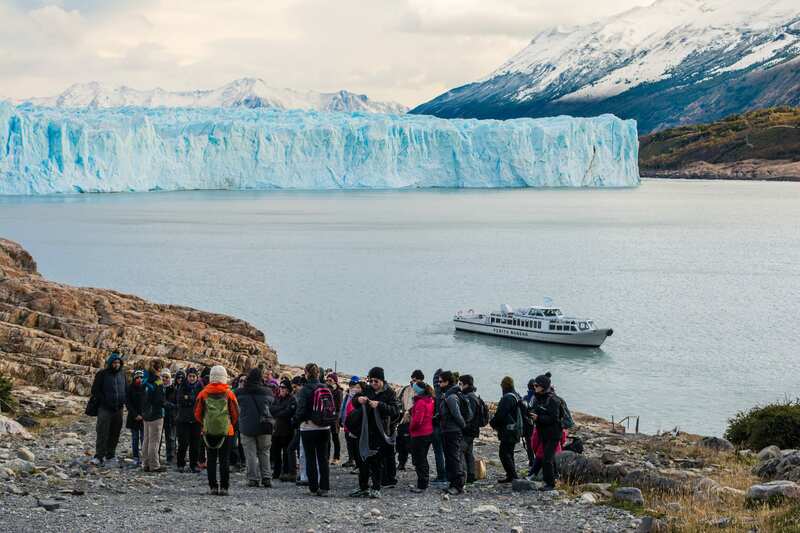 Included: Transportation mentioned above, boat ride, bilingual guide (English / Spanish), National park Los Glaciares entrance. 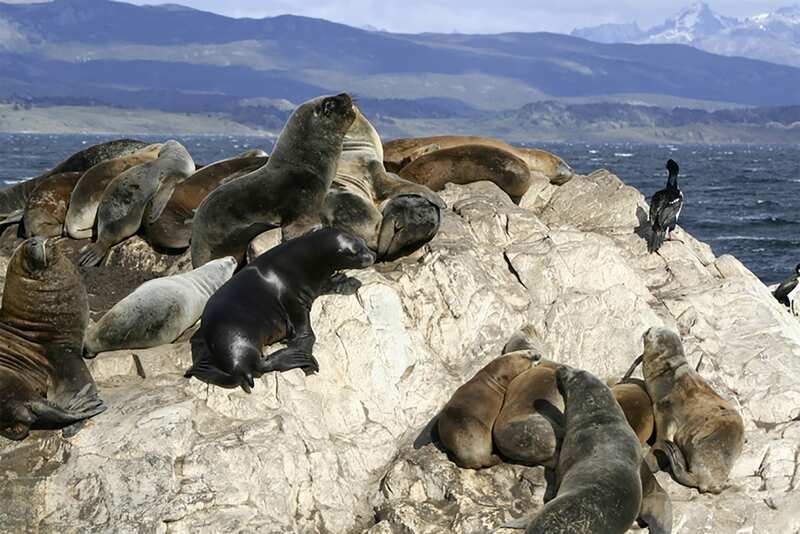 Today is yours to explore El Calafate. Our advice is to explore the rural culture of Patagonia, venturing onto a day tour to the ever-impressive Estancia Cristina. Sail the turquoise water of Lake Argentino to reach the estancia, deeply rooted in the Glaciers National Park. 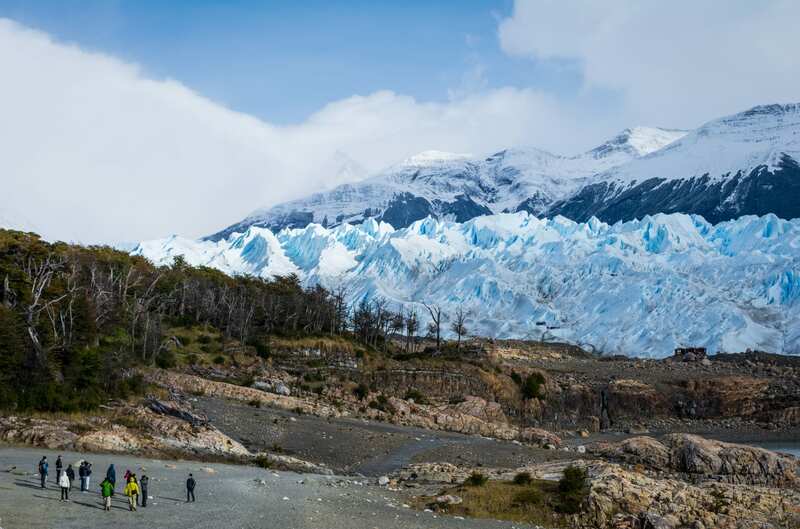 Enjoy the vastness of the setting, a 4x4 ride to get stunning views of Upsala Glacier, and taste a juicy Argentine steak cooked in its natural and ideal environment (these extra day activities can be booked on request). This morning you’ll be transferred to the airport to take your flight. Upon arrival in Ushuaia, you will be taken to your hotel. Ushuaia is a small town, making it easy to get around on foot. 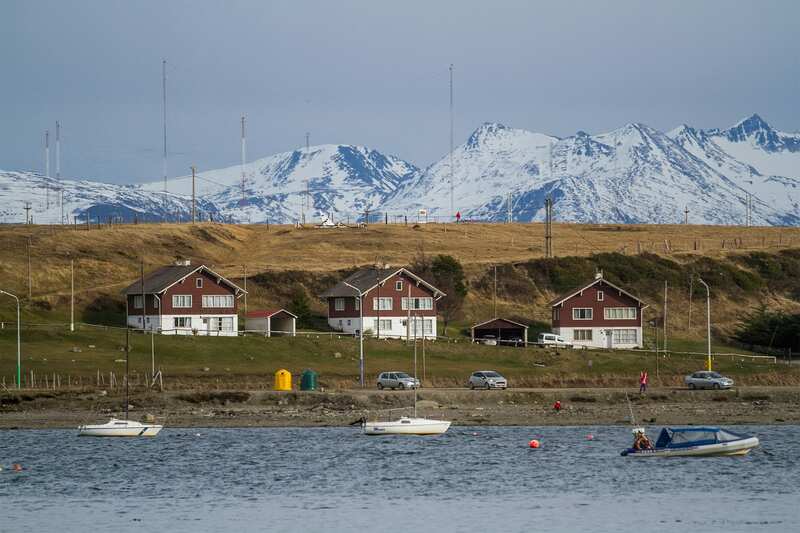 The Yamanas, its first inhabitants, called it Ushuaia which means “protected bay” in their language. It was officially incorporated into the Republic of Argentina in 1884, in order to establish a permanent Argentine settlement. Take the afternoon to explore the town or visit one of its museums. The Thematic Gallery of the Historia Fueguina will present you with more than 120 life size figures, that will tell you all about the history of Ushuaia. Or, unearth the story of the most dangerous criminals at the Prison Museum. And please, don’t forget the local gastronomy! Ushuaia has some of the finest seafood in the world—try the outstanding Blake Hake. Today we’ll pick you up at your hotel to begin our journey to the world famous Tierra del Fuego National Park, just 12 km (7.4 miles) away from the city. 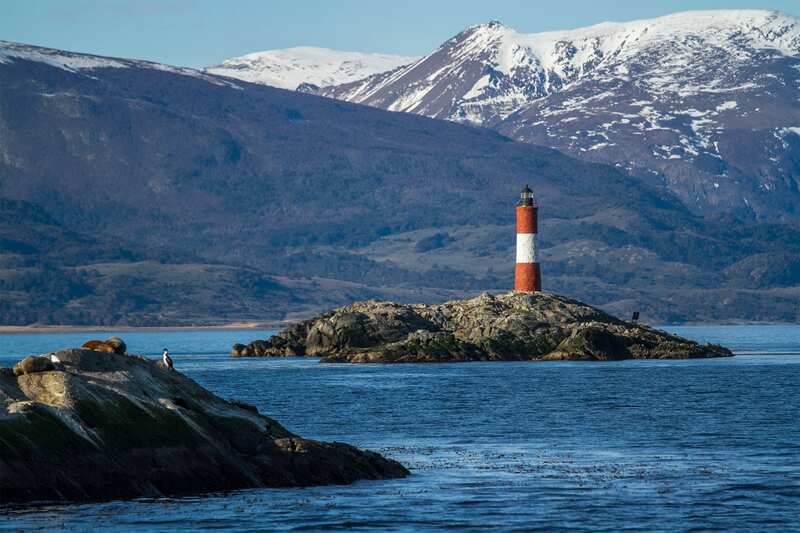 Once at Ensenada Bay, you will have time to enjoy the view over the Beagle Channel before you start hiking along the coast. Six kilometers (3.7 miles) of wild trail await you, where you’ll discover native flora and wild fauna. After this 3 hour hike, you will reach Lake Roca where lunch will be served. After a full homemade picnic, you will start the second part of this adventure. We will have the opportunity for a 1.5 hour canoeing trip along Lapataia river! Make it all the way to Lapataia Bay, where the Panamerican Highway and National Route 3 ends at an awe-inspiring landscape. After discovering the unique vastness of this breathtaking setting, we’ll take you back to your hotel to rest, and enjoy another Patagonian evening. Included: transportation mentioned above, bilingual guide (English/Spanish), Tierra Del Fuego National Park entrance included. Note: canoeing is only available for children over 5 years old. In 1833 Charles Darwin sailed the Beagle Channel and discovered something great. Today is your turn to become another explorer of this channel, primitively named Onashaga Channel since the Onas where its first sailers. As the vessel leaves the coast, you will gain panoramas of Ushuaia Bay, where the city lies proudly crowned by the Martial Glacier. Unearth the diverse marine wildlife, such as cormorants (flying birds, closely related to penguins) and fur seals on Alicia Island. 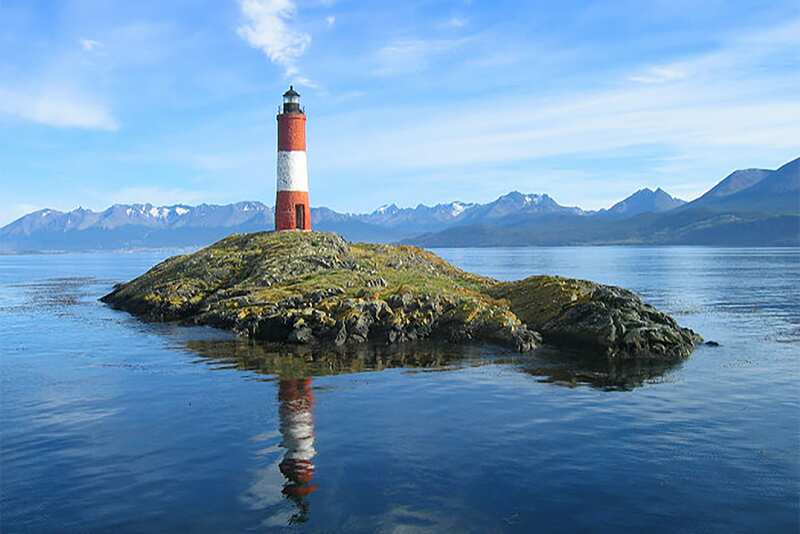 Argentina standing at your left and Chili at your right, you’ll sail this natural border until reaching the iconic end-of-the-world lighthouse, the ancient guard of the bay. On your way back, you’ll stop at Bridges Island to walk a wildlife interpretative path, learn about Yaman’s history (the native inhabitants), and see the largest shelly deposits of the region. During the trip, you can enjoy a delicious hot chocolate with cookies or try the yerba mate, a favorite Argentine drink. Once we get back to the port, you can make your way back to your hotel or stop by a local café or brewery to try the amber cream craft beer with a traditional Patagonian appetizer. This afternoon, you will be transferred to the airport for your flight back to Buenos Aires. Upon arrival, you will have a private transfer to your hotel. Not included: port tax - $2 USD, transportation to and from the port. Today, you will be transferred to the airport for your international flight home. Transfers & Meals mentioned in the itinerary. Bilingual guides (English/Spanish) when mentioned in the itinerary. Tipping is not compulsory but it is greatly appreciated throughout South America, especially in the service industry. If you are satisfied with the services provided by your Destination Host, tour guides and drivers, then we recommend rewarding their hard work by tipping. In general, we suggest a tip of around US$20 - 25 a day for guides and US$ 5 -10 for drivers. When tipping Hotel & Restaurant Staff, tips are generally 10% of the total bill.